Passed B.Sc Nursing/ B.Sc Nursing Post Basic/ B.Sc Post Certificate from a Recognized Institute/ University and Registered with State/ Indian Nursing Council. Eligible Candidates can Submit RIMS Staff Nurse Grade A 2019 Application to the Official Address Latest by 30th April 2019. 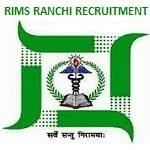 Click on Staff Nurse Grade A Positions in RIMS Recruitment Advertisement.